When we talk about stewardship, it goes far beyond money. We are called as Christians to be good stewards of the bodies that we've been given to bring God glory. 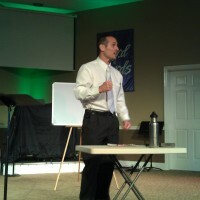 On Wednesday, May 23, 2012, Dr. Toney of the Cumberland Chiropractic Clinic in McMinnville was the guest speaker to talk about "Nutrition & the Temple." Dr. Toney debunked many myths concerning nutrition and our body. Many were there to take part in the discussion and receive great information of how we can live healthier lives for the glory of God. 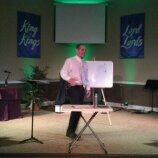 Pastor DeWayne shared his experience after seeing Dr. Toney over the last 6 months. "I have personally lost 24 lbs., gone off of my blood pressure medicine, and stopped taking medication for acid reflux. It's all gone! I sleep better and all through the night. I no longer wake up drenched from night sweats." Thanks Dr. Toney for sharing your time and info with us and we'll bring you back again soon!